Kama’aina (local) families own most of the local coffee farms and have for generations. There is a difference in quality of beans between the coffee farms. 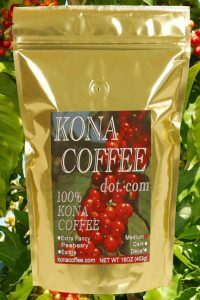 At KonaCoffee.com we expend great effort to taste test and source the best crops from local growers to ensure you get the best cup of Kona possible. We source our coffee directly from local farms, roast it fresh and ship fast and directly to you. The most trusted seller of gourmet quality coffee in Kona Hawaii. As a local family owned and operated business, you can trust you’re getting real Kona. If you have any questions about purchasing email us or call for more information. Visit our coffee information pages and calendar for Kona events and coffee news on the Big Island of Hawaii. Shop for Kona Coffee and get free shipping now! 100% Pure Coffee direct from Kona, Hawaii.